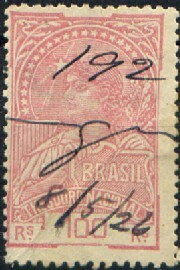 For more fiscal stamps of Brazil, click here. In the colour green (with red value): 200 r, 400 r, 600 r and 800 r.
In the colour orange (with blue value) in a larger size: 1000 r, 2000 r, 3000 r, 4000 r, 5000 r, 6000 r, 7000 r, 8000 r, 9000 r, 10000 r, 11000 r, 12000 r, 13000 r, 14000 r, 15000 r, 16000 r, 17000 r, 18000 r, 19000 r and 20000 r.
Most of these stamps exist perforated and rouletted (the 200 r even exists with vertical perforation and horizontal rouletted). The following values exist: 100 r light brown, 200 r light brown (three types), 400 r light brown (2 types), 500 r light brown. In a larger size: 1000 r light brown (2 types), 2000 r light brown (2 types), 5000 r light brown, 10000 r lilac and 20000 r lilac. 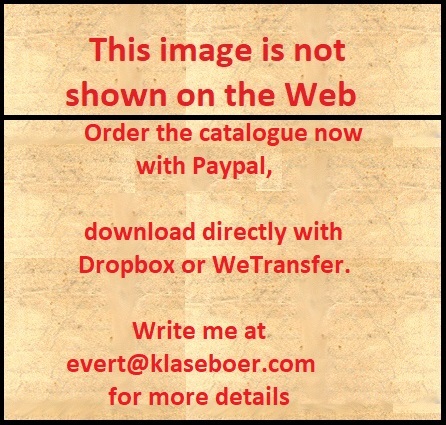 The above fiscal stamp is used postally. In 1884 a new type with emperor facing left was issued in the values 500 r lilac and 10000 r lilac (larger size). In this design (borders different for each value) exist: 2000 r, 3000 r, 4000 r and 5000 r (all in lilac colour). The values 10 r grey (value red), 20 r green (value red) and 50 r red (value black) were issued. 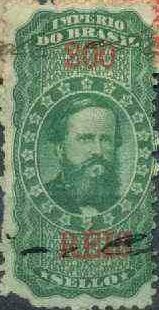 Two types of the value inscription (small and large) exist for the values 10 r and 20 r.
Many values exist, also with blue border. I have seen 20 r red and lilac (blue border), 100 r black and lilac (black border), 300 r green and lilac (blue border), 400 r brown and lilac (blue border), 400 r brown and lilac and 500 r violet and lilac. I've seen the value 200 r lilac (in two types, see above). More stamps in a similar design could exist. Largest size: 50000 r red (two shades) and 50000 r violet. I've only seen the value 200 r brown with yellowish brown background pattern. Only the value 100 r red was issued. The values 300 r green (with yellow background pattern) and 300 r brown (1903) exist. In this design exists: 100 r red, 200 r orange, 300 r blue, 300 r red, 400 r red and 500 r brown. In a slightly larger size: 1000 r blue, 1000 r orange, 2000 r yellow, 3000 r green, 4000 r red, 4000 r olive, 5000 r green and 5000 r violet. In the largest size: 10000 r red, 15000 r violet, 20000 blue, 20000 r brown and 50000 r green. The 300 r has a slightly different design (see image above). The following values were issued: 10 r red, 20 r red and 50 r blue. In a slightly larger design: 100 r green and 300 r green. I have seen the values: 100 r red, 200 r blue, 300 r orange and 500 r green. With ornamented border all around the stamp: 1000 r brown, 2000 r red, 3000 r green, 4000 r lilac, 5000 r brown. In a slightly larger design: 10000 r orange and 50000 r brown. In the above design I have seen the values: 1$000 blue, 2$000 red, 3$000 brown, 4$000 lilac, 5$000 orange and 50$000 green. Other values might exist. I have seen the values 100 r green, 300 r red, 400 r brown, 500 r orange and 600 r lilac. In the same design, but with inscription 'LOTERIAS' I have seen the value 100 r red. In the same design, but with inscription 'COLLECTORIAS FEDERAES DO INTERIOR' I have seen the value 600 r blue. I've only seen the value 20$000 olive in this particular design. I have only seen the value 300 r green in this design. In this design I have seen: 100 r red, 300 r brown, 500 r violet, 600 r olive, 1000 r red, 2000 r yellow, 4000 r orange and 20000 r brown. In this design I have seen: 2$000 blue and 4$000 violet. I've only seen the value 100$000 brown in this design.